Ageing is the accumulation of changes in an organism or object over time. 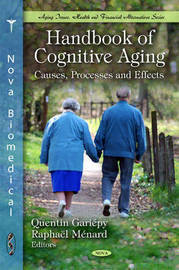 Ageing in humans refers to a multidimensional process of physical, psychological, and social change. Some dimensions of ageing grow and expand over time, while others decline. Reaction time, for example, may slow with age, while knowledge of world events and wisdom may expand. Research shows that even late in life potential exists for physical, mental, and social growth and development. Ageing is an important part of all human societies reflecting the biological changes that occur, but also reflecting cultural and societal conventions. More people are reaching older age today than ever before and the incidence of dementia is thus expected to rise. It is important to investigate the possible prevention of dementia and cognitive decline. This new book gathers the latest research from around the globe in this field of study and related topics such as cardiovascular disease and cognitive function, physical exercise and cognitive function in the elderly, the dementia diagnosis, the role of MRI in Alzheimer's disease, oestrogen decline effects on the mental health of ageing women and the relationship between dementia and depression.